Ingenico Group is about to take conversational commerce mainstream with the launch of a payment-enabled messaging bot that will transform the way we buy online. E-commerce has been booming for some time now, however it’s still far from perfect – purchasing items can sometimes be a tedious, frustrating process. It’s little wonder that over two thirds of online shopping baskets are abandoned, leaving merchants without a sale. To help bring retailers and brands closer to customers, Ingenico has partnered with Californian start-up Joinedapp to create a payment-enabled chatbot for retailers and travel merchants that facilitates conversational commerce on all major messaging platforms including Facebook Messenger, Line, Telegram, Kik, Skype, Slack and WeChat. Why? Well, consumers may be spending more time than ever on their smartphones, but their attention rarely strays from their favourite few social media apps. The Ingenico bot offers a means to escape the app-trap and helps streamline the online purchasing process. Residing within larger platforms such as Facebook Messenger, Ingenico’s conversational commerce solution enables sales to be completed without leaving the messaging app, increasing conversions and revenues for the merchant. “You can personalize the experience – when a customer interacts with a brand on Facebook Messenger, for example, the bot learns their patterns of behaviour and develops a private, ongoing conversation that can be fine-tuned over time,” says Gertjan Dewaele, Product Intelligence and Innovation Manager at Ingenico ePayments. Bots encourage impulse purchases, one of the many reasons why this technology should bolster merchants’ sales, says Arash Hassibi, Joinedapp chief executive officer and co-founder. Current promotional tools on e-commerce websites usually include email marketing campaigns featuring coupons and offers, but the process of convincing consumers to act on these carries a lot of friction, limiting conversions, says Hassibi. Bots, in contrast, create a one-on-one conversation with the customer and so enable merchants to curate offers more precisely and deliver these within the bot. Promotions and sales are conducted seamlessly within the same conversation, minimizing any friction in the buying process to maximize response rates. Bots have yet to gain significant traction with consumers, but that will soon change and, with the 10 most popular messaging apps claiming over 5 billion monthly users combined, the potential of conversational commerce is vast. Natural language processing (NLP) is key to the bot’s artificial intelligence. NLP templates, or ‘bot skills’, allow the bot to respond in a meaningful way to anything the customer writes, from asking advice about skincare products to enquiring about the weather, for example. “Imagine the user writes that they want to book a hotel in Paris. The AI understands it must ask follow-up questions such as the number of people and how many nights. It can even show a calendar to select the dates,” says Hassibi. Large companies across all different verticals, from online retail to travel, are the principal target market for Ingenico’s bot. Embedded within the bot is Ingenico Connect, the new online payment front-end of Ingenico ePayments. The bot acts as the hub, or connection point, between the customer and the merchant’s ordering system. Another AI bot component critical to e-commerce is predictive analytics, which scrutinizes user behaviour to personalize content. “Say you buy a skincare product with a lifetime of a month. After a month, the bot will send you a message asking if you’re running low and if you would like to buy a refill,” adds Hassibi. Ingenico’s collaboration with Joinedapp deepened in June, with the French firm providing seed funding to become a stakeholder in the US start-up. Bots can also exploit a growing trend among consumers to access the Internet through messaging apps rather than browsers such as Google Chrome and Firefox. Which industries do you think offer the most potential for conversational commerce? Anything related to retail, where you can show products, give recommendations, create customized product offerings – it’s these kinds of interactions that work best. The bot works especially well in cosmetics, fashion etc. Also travel – if I want to book a flight, I can chat with the bot to book my flights or a hotel in just a few quick steps. More broadly, for any company on the web, it's conceivable they would also want to have a presence on messaging apps. At the moment, it’s typically the big brands that can be retailers as well. How do you see conversational commerce developing? I see it as a new paradigm in retail – if you look at an e-commerce web-shop today, it's almost a recreation of the experience of shopping at a supermarket in the real world. You go there, see a rack with all the products, select the products you want, put them in a basket, go through the checkout. You do the same in an e-commerce web-shop, but it's not necessarily what the consumer wants – for bricks-and-mortar stores, lots of retailers are changing the way they operate their shops. They're no longer funnelling customers through checkout lines, it's more about having people spend time in the store to give advice to customers, and a chatbot allows you to do the same. In fact, e-commerce websites are almost an anomaly because for hundreds of years people have shopped and purchased products through conversation. Bots are bringing e-commerce back to a conversational model. Of the $1 trillion of e-commerce spending, almost nothing is being transacted on messaging apps. The potential is incredible. How will consumers learn these bots are available? On Facebook Messenger, Line, Telegram etc., you can search for a business and then interact with that business in the same way you would go to a browser and search for a business’s website. That's already in place – what's not in place are all the brands and merchants on messaging apps. It's kind of a chicken and egg problem, but there's no technical limitation as far as discoverability through these platforms so it's pretty much similar to the web. For onboarding to a bot, a brand would create social media adverts targeted to its preferred demographic. In that advert will be a ‘click to messenger’ link that will take them to the bot. It’s similar to what brands are doing to take people to their website or app. Joinedapp is based in California, so are you looking at the US market first, or will it be a global deployment? We’re looking at this from a fully international dimension, but the US and Europe are our main targets to begin with. Gertjan is leading the Innovation and Product Intelligence team within Ingenico ePayments. He has several years of experience in e-commerce, in several roles at Ingenico and is passionate about new trends in payments, technology innovation and online consumer experience. 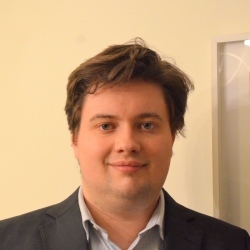 Prior to that, Gertjan worked in strategy consulting at the Boston Consulting Group and he holds a Master in Computer Science Engineering from Ghent University. Arash Hassibi is the CEO of Joinedapp a startup company located in San Francisco, California that enables brands & merchants to provide their products and services for users on messaging apps. Arash is a serial entrepreneur with a PhD in Electrical Engineering from Stanford University, and is the author of more than 15 research publications and inventor of 10 patents. His expertise lies in software development, mathematical modeling, and numerical optimization applied to a variety of fields such as predictive analytics, natural language processing, design automation, statistical signal processing and control. Joinedapp is incubated by the Stanford-affiliated accelerator StartX and Plug & Play Brand and Retail.